Recently the dolphins of Xel-ha ecopark have gained the company of three adopted West Indian Manatees. These new family members are now being studied to see if it's viable to have some interactive program with the animals. Speaking for myself I'm not particularly fond of comercial exploitation of animals. On the other hand the dolphins in Xel-ha and sister-park Xcaret are very well taken care of. They have their own specialized team including marine biologists and vets and Xel-ha's reproductive program is reknown throughout the world. Let's face it, tourists today want this kind of activity, and where there's a demand someone's always going to jump at it. And despite the commercial aspect I do believe these theme parks like Xel-ha and Xcaret play an important role in environmental education and protection. Anyway, the West Indian Manatee belongs to the Sirenia order and yes, these are the animals responsable for the legend about Mermaids. I suppose that looking at them from a certain distance one could confuse them with a voluptuous woman. It could also be the first person to start the legend had bad eyesight or...he was simply very desperate after a long voyage at sea and the wish was the father of the command. Manatees are also known as sea cows. Like a cow, they 'graze' the bottom of shalow waters for sea-grasses. They are almost completely herbivorous, but they may occasionally have a side-dish of invertebrates or small fish. In Xel-ha they are fed mainly lettuce. 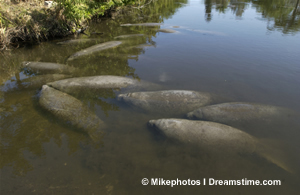 The West Indian Manatee used to live in large quantities along the Caribbean coast of the Yucatan Peninsula and Belize. Now they are sparse. With some luck you can observe them on a boatride through the mangrove canals of Si'aan K'aan biosphere or in the bay of Chetumal. These gentle, rather plump-looking marine mammals are capable of suprisingly agile moves in the water.